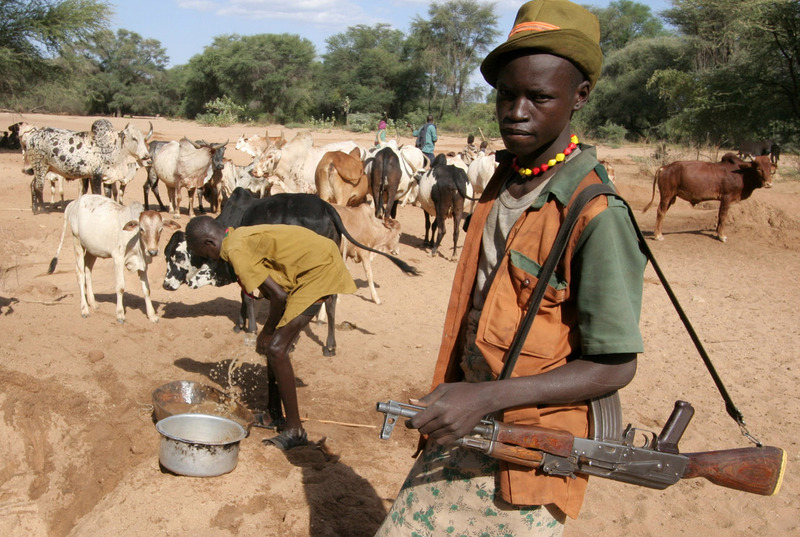 Cattle raids, inter-communal resource conflicts and banditry are common across much of the arid lands of northern Kenya, where firearms are increasingly common among pastoralist communities. In 2009 alone, such violence claimed more than 354 lives, according to the UN Office for the Coordination of Humanitarian Affairs (OCHA), Kenya. According to OCHA, the onset of the short rains, from mid-October to December, tends to increase the likelihood of cattle raids and thus conflict, because this is when pastoralists restock their herds and it also when rites of passage take place, increasing the demand for livestock. In Samburu district, morans, or young warriors, frequently target livestock traders and passenger cars on main roads. “People are not able to take their livestock to the market in Dagoretti [in Nairobi about 350km south],” said Peter Emanman, a resident of the Samburu town of Maralal. “If security were improved, people could be self-reliant,” he said. Livestock movement in search of water and pasture remains a driver of conflict. “Competition for scarce natural resources is widely understood to be a primary cause of conflict in the region,” notes UK think-tank, the Overseas Development Institute (ODI), in a November report, Pastoralists’ vulnerability in the Horn of Africa, Exploring political marginalisation, donors’ policies and cross-border issues. Pastoralist communities across the Horn of Africa frequently cross national borders in search of pasture and water. Although neighbouring states often share ethnic groupings, such migrations can be problematic. “Sometimes there are cross-border attacks,” Rashid Osman, an assistant chief in the town of Moyale, told IRIN, adding that these were especially frequent during the rains. “During the drought, the police are sent to seal the wells, but during the rains it is less secure,” he said. “Rainfall is an indicator of conflict." Land demarcation is also presenting a problem, Godana of PISP told IRIN. “Communities are claiming ownership of territories and regions yet … the boundaries are not clear,” he said. The loss of communal grazing land to farming and environmental degradation has also fuelled conflicts in a number of pastoral areas across the Horn of Africa region, states ODI, noting that freedom of movement over large areas was a crucial element of the pastoralists’ dry lands resource management system. “Competition for scarce natural resources is widely understood to be a primary cause of conflict in the region and is in part related to the inability of pastoralists to assert their land rights,” ODI adds. “The absence of the government in some parts makes people take the law into their own hands,” said PISP’s Godana. Poor leadership and a breakdown in community values also help to foster insecurity, he said, adding: “The role of elders is fast diminishing and people are [instead] operating in cliques. Remote areas in the north rely on community-organized security groups such as home guards and police reservists to maintain law and order. This has in part led to the proliferation of weapons in the north - as has the proximity to unstable neighbours such as Somalia. 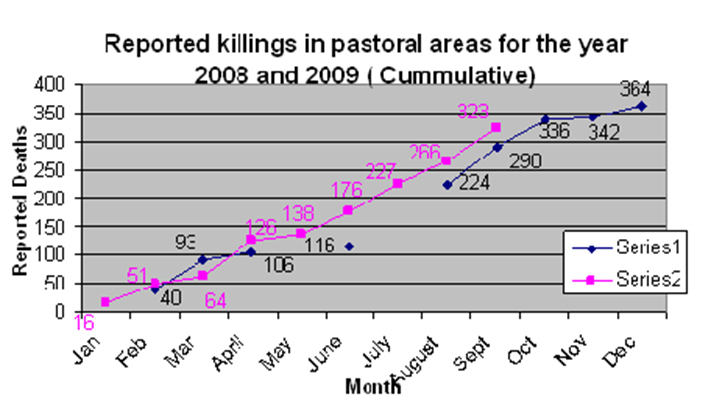 According to the ODI, politics can be a driver of conflict in pastoralist areas. “Since the second half of the last century, pastoralists have also been involved in larger conflicts in the region and many have joined armed opposition groups. For example, the presence of the Oromo Liberation Front [OLF] in northern Kenya has provoked several Ethiopian military incursions into Kenya,” it said. This is true in Moyale, where the District Commissioner, Joshua Nkanatha, confirmed that there were “occasional incursions by the Ethiopian army” in search of OLF forces. “We tell them [the Ethiopian forces] to inform us of impending incursions,” he said. Some residents see the cattle raids as a ploy to drive away specific communities ahead of 2012 national polls, Samburu DMO, Samuel Lempushuna told IRIN. New election constituencies are likely to be created before the polls and ethnically dominant communities stand a better chance of electing a leader from among their own. Already, a new district, Baragoi, has been carved out of Samburu, north of the main town of Maralal. It borders the Turkana region, and is mainly occupied by the Samburu and Turkana, who clash from time to time, which could result in the Samburu being marginalised.